For other ships with the same name, see SS Orizaba and Brazilian ship Duque de Caxias. Refit: April–May 1941, Bethlehem Steel Co.
Orizaba was 423 feet 0 inches (128.93 m) long between perpendiculars, with a beam of 60 feet 0 inches (18.29 m). She had a depth of 15 feet 7 inches (4.75 m) and a draft of 35 feet 0 inches (10.67 m). Propulsion was four steam turbines of 1,908 nhp driving twin screw propellers through single reduction gearing. She was fitted with 13,107 cubic feet (371.1 m3) of refrigerated cargo space. The refrigerant was brine and insulation was by means of cork. Orizaba—named after the town of Orizaba, Veracruz, Mexico—was laid down for the Ward Line by William Cramp & Sons Ship and Engine Building Company of Philadelphia and launched in February 1917. In mid-1917 the United States Shipping Board (USSB) commandeered and received title to all private shipbuilding projects in progress, including the still-incomplete Orizaba and her sister ship Siboney. Plans for both ships were modified for troop-carrying duties. Upon Orizaba’s completion, the USSB delivered her to the US Navy for transport duty on 11 April 1918, and she was commissioned as USS Orizaba (ID-1536) on 27 May. Assigned to the Atlantic Transport Service, Orizaba carried over 15,000 troops in six convoy trips to France before the end of World War I. In one such voyage, Orizaba’s executive officer, ordnance expert William Price Williamson, worked closely with Commander Richard Drace White—Orizaba’s commanding officer, himself an ordnance expert—to develop a workable depth charge launcher which would provide the transport with a measure of protection from enemy submarines. Williamson set about modifying a Lyle gun into a depth charge launcher, and successfully tested it on 16 August 1918. While attempting another test with an increased propellant charge the following day, a defective fuse exploded the depth charge prematurely, killing Williamson and three other sailors. White, four other officers, and twenty-two enlisted men were also wounded in the blast. Four days later on 21 August at 08:30, Orizaba, traveling with Siboney, spotted a submarine in the act of submerging. Orizaba attempted to ram the sub and dropped depth charges, but there was no indication that the attack was successful. In December 1918, she was temporarily assigned to assist the French government in repatriating French, Belgian, and Italian prisoners of war. Detached from that duty on 10 January 1919, she joined the Cruiser and Transport Force at Brest, and in nine voyages returned over 31,700 troops to the United States. 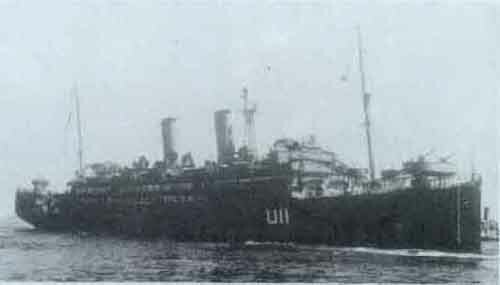 After the completion of transport duty service in the summer of 1919, she was decommissioned on 4 September and subsequently turned over to the Army for further transport service as USAT Orizaba. The boat served in that capacity until returned to the Ward Line in 1920. According to the Statistical Department of the US Navy, Orizaba had the second-shortest average in-port turnaround time out of 37 US Navy transports used in World War I. The ship completed 15 round trips with an average turn-around time of just over 30 days per trip, while the overall Navy average was 39.8 days. After Orizaba and Siboney were reacquired by the Ward Line, Orizaba was registered as a merchant vessel. Her port of registry was New York, and United States Official Number 216294 and Code Letters LJKM were allocated to her. Orizaba and Siboney were placed in transatlantic service on New York–Cuba–Spain routes in 1920, with Orizaba calling at Corunna, Santander, and Bilbao in Spain. The two ships accommodated 306 first-class, 60 second-class, and 64 third-class passengers, with each ship making several trips on the route, but a lack of passengers (along with the grounding of Siboney at Vigo in September 1920) led to the abandonment of the route. By October 1921, Orizaba was placed in New York–Cuba–Mexico service, where business thrived, in part because of Prohibition in the United States. Ward Line cruises to Havana were one of the quickest and least expensive ways to what one author called "alcohol-enriched vacations". Three years later, the ship underwent a major refit that, among other things, lengthened her funnels. A typical voyage at this time sailed from New York and called at Nassau, Havana, Progreso, Veracruz and Tampico. By the early 1930s, Orizaba’s typical route had remained virtually the same, though Nassau and Tampico were dropped as ports of call. It was in this period that American poet Hart Crane leapt to his death from Orizaba. At around noon on 27 April 1932, while the ship was headed to New York—some 275 miles (443 km) north of Havana and 10 miles (16 km) off the Florida coast—Crane, clad in pajamas and overcoat, climbed the rail at the stern of the ship and plunged into the ocean. The captain of Orizaba immediately stopped the ship and launched four lifeboats that searched in vain for two hours, but no trace of the poet was ever found. Before he jumped, Crane had been drinking and, the night before, had been the victim of violence after a unwanted pick-up attempt of a crewman ended with a severe beating. Katharine Hepburn, seen here in 1941, sailed on Orizaba to get a Mexican divorce in 1934. In 1934, Orizaba was allocated the Code Letters WECX. In April 1934, American actress Katharine Hepburn sailed from New York on Orizaba, eventually ending up in Mérida, Yucatán. After her arrival there on 22 April, she filed for divorce from businessman Ludlow ("Luddy") Ogden Smith, whom she had married in December 1928. After the divorce was finalized she and her travel companion, Laura Harding, planned to spend a week in Havana and return to New York on the Ward Line ship Morro Castle. Other notable passengers on Orizaba in the 1930s included Ecuadorean diplomat Gonzalo Zaldumbide and Cuban president Fulgencio Batista. Zaldumbide, the Ecuadorean Minister to the United States, sailed to Mexico for his new posting as Minister to Mexico in August 1932. In February 1939, Orizaba carried Cuban leader Fulgencio Batista back to Havana after a two-week goodwill visit to Mexico. Beginning in the mid-1930s, Orizaba often carried gold and silver bars from Veracruz to New York for the Federal Reserve Bank of New York, Chase National Bank, or for later transshipment to London. In October 1933 three short tons (2.7 tonnes) of gold bars and coins were shipped on Orizaba for eventual delivery to London, prompting some to believe that gold was being smuggled into Mexico to take advantage of its policy of not charging duties on gold. In July 1934 Orizaba brought in 16 cases of Mexican gold, and in January 1935, 20 cases; in both instances, for delivery to Chase National Bank. Twice in 1935, the Ward liner delivered over 1,000 bars of silver for the Federal Reserve Bank, bringing 1,390 bars in March, and 1,933 bars in July. Mexico was not the only place from which Orizaba delivered precious metals. In March 1934, she delivered 12 cases of gold—consisting of 84 bars, and worth $1,624,000—from Havana for Chase. In mid-1939, Orizaba was chartered to United States Lines as one of five ships added to increase what was perceived as a slow rate of return of US citizens fleeing war-torn Europe. In September, the ship was diverted to Galway to pick up American survivors of SS Athenia, torpedoed by U-30 on 3 September; Orizaba returned with 240 of the survivors later that month. After completing evacuation service, the ship was laid up in New York in the summer of 1940, and subsequently purchased by the Maritime Commission on behalf of the Army on 27 February 1941. After her reacquisition by the War Department, Orizaba completed one round trip to the Panama Canal Zone. On her return she put in for a refit by the Bethlehem Steel Company at New York. After she was transferred to the Navy on 4 June 1941, she was commissioned as Orizaba (AP-24) on 15 June 1941. Following several months of coastal operations, Orizaba, now armed with two 5-inch (130 mm) guns and four 3-inch (76 mm) guns, departed New York in April 1942 on the first transatlantic run of her Second World War. Sailing via Iceland, she steamed to England, Cape Town, Recife, and Norfolk, Virginia, from which she got underway for Bermuda and Puerto Rico. Returning to Norfolk in January 1943, she plied the eastern seaboard for a month, then took up transatlantic duties again. Until July she traversed the ocean to Oran, Algeria, carrying troops over and prisoners of war back to New York. On 5 July she left Oran in Task Force (TF) 81. The next day, she rendezvoused with TF 85 and on 9 July stood off Gela, Sicily, disembarking troops into landing craft. On 11 July, she sustained slight damage in an enemy air attack and retired to Algeria the next day with casualties and prisoners on board. She returned to Sicily at the end of the month to discharge troops and cargo at Palermo and then, on the night of 1 August, weighed anchor and stood out for home. Arriving at New York on 22 August 1943, she underwent an overhaul, then took on runs to Brazil and the Caribbean. At the end of the year she left the east coast, passed through the Panama Canal, and sailed on to the southwestern Pacific. After calls at Samoa, Nouméa, Brisbane, and Milne Bay, she returned to the west coast in March 1944, only to leave again for another central Pacific run. Back at San Francisco in June, she underwent repairs; completed a run to the Marshalls and Marianas; and then sailed north to the Aleutians. Completing her northern run at Seattle, Washington, on 1 December, she carried men and supplies to Hawaii, then returned to San Francisco, later sailing to New Guinea, the Philippines, and Ulithi to add men and materiel to forces gathering for the Battle of Okinawa. From Ulithi, Orizaba sailed east, passed through the Panama Canal again, and, as the battle for Okinawa raged, arrived at Tampa, Florida. Decommissioned on 23 April, she underwent an overhaul and on 16 July 1945 she was transferred to Brazil under the terms of Lend-Lease. The ship was permanently transferred to Brazil in June 1953 and struck from the US Naval Vessel Register on 20 July of that same year. Orizaba received one battle star for her US Navy service in World War II. Assuming control of the vessel at Tampa on 16 July 1945, the Brazilian Navy renamed the veteran transport Duque de Caxias (U-11), the second ship of that navy named in honor of Luís Alves de Lima e Silva, Duke of Caxias, the patron of the Brazilian Army. Duque de Caxias headed to Naples and on 28 August 1945 left there with elements of the returning Brazilian Expeditionary Force. The ship arrived at Rio de Janeiro for the first time on 17 September 1945. 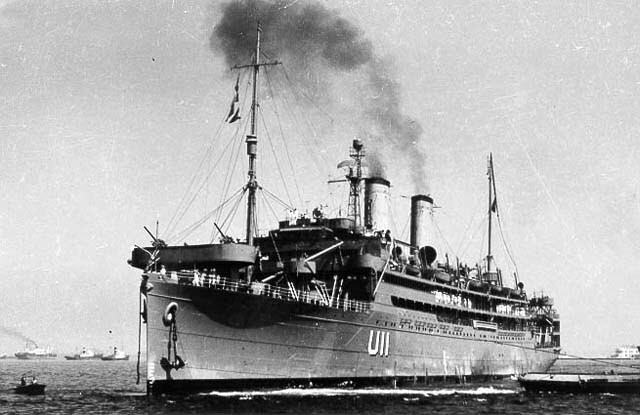 The ship then loaded American military stores from US bases in Brazil and sailed for New York, arriving on 10 November 1945, with plans to repatriate wounded Brazilian soldiers who had been recuperating in the US. On 31 July 1947, a day after sailing from Rio de Janeiro for Europe, oil spilled on the ship’s boilers, causing an engine-room fire that quickly spread through the first class cabins and killed 27. The ship was towed from its position off Cabo Frio into Rio de Janeiro on 1 August 1947. The ship had been carrying 1,060 passengers bound for Lisbon, Naples, and Marseille, along with 500 crew members, and had been scheduled to carry Italian refugees on its return voyage. In 1953, Duque de Caxias was converted into a training ship, and in August of that year began a European and Mediterranean training cruise, which included a 12-day visit to New York in March 1954 as part of its homeward leg. The ship visited the United States again in December 1955, with midshipmen aboard who were touring the United States Naval Academy and who were honored at a cocktail party by the Brazilian Ambassador, João Carlos Muniz, at the Brazilian Embassy in Washington, D.C. In October the following year, Duque de Caxias called at Philadelphia, and the new Brazilian Ambassador Ernani do Amaral Peixoto—also an Admiral in the Brazilian Navy—and his wife sponsored a tea dance in honor of Captain Antonio Andrade, other officers of the ship, and the midshipmen aboard the ship; Peixoto had traveled to Philadelphia to greet Andrade, a former naval attaché at the embassy. The ship was decommissioned 13 April 1959, and finally scrapped in 1963. ^ a b c Charles, p. 47. ^ a b Priolo, Gary P. (9 June 2006). "ID-1536 / AP-24 Orizaba". NavSource Online. NavSource Naval History. Retrieved 22 January 2008. ^ a b "Lloyd's Register, Navires a Vapeur et a Moteurs" (PDF). Lloyd's Register. Lloyd's of London. 1933. Archived from the original (PDF) on 28 May 2018. Retrieved 27 May 2018. ^ "List of Vessels Fitted with Refrigerating Appliances" (PDF). Lloyd's Register. Lloyd's of London. 1930. Archived from the original (PDF) on 3 April 2016. Retrieved 27 May 2018. ^ a b c d e f g h i "Orizaba". DANFS. ^ Crowell and Wilson, p. 321. ^ "Williamson". Dictionary of American Naval Fighting Ships. United States Navy. Retrieved 21 January 2008. ^ United States Navy, Statistical Department (16 August 1919). 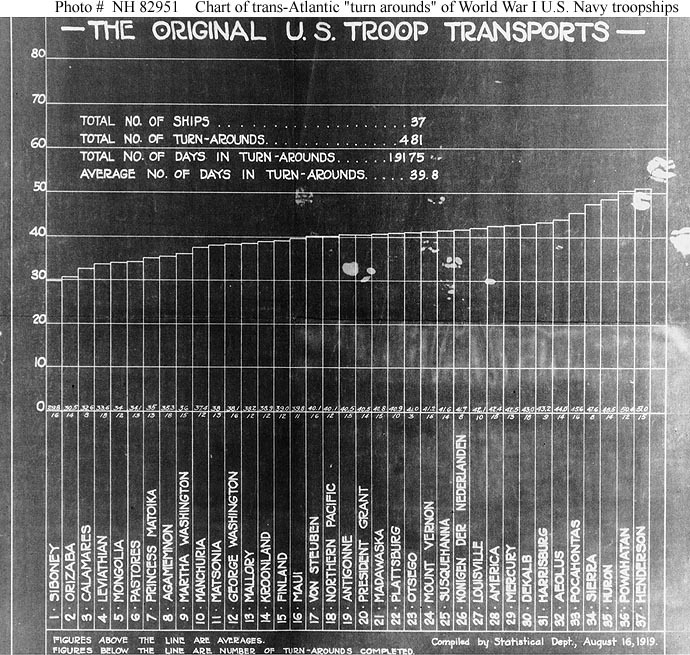 "The Original U.S. Troop Transports". Archived from the original (image file) on 6 February 2007. Retrieved 21 January 2008. ^ "Siboney aground at Vigo" (pdf). The New York Times. 11 September 1920. p. 10. Retrieved 19 January 2008. ^ a b Flayhart, p. 292. ^ Alderson, Michael. "S.S. Orizaba of 1917". Wardline.com. Archived from the original on 19 October 2007. Retrieved 22 January 2008. ^ "Proposed sailings for November & December 1921 and January 1922" (scan and summary of timetable at Maritime Timetable Images). New York and Cuba Mail Steamship Company. 21 October 1921. Retrieved 21 January 2008. ^ "Proposed sailings and passenger fares" (scan and summary of timetable at Maritime Timetable Images). New York and Cuba Mail Steamship Company. 1 June 1933. Retrieved 21 January 2008. ^ "Lloyd's Register, Steamers and Motorships" (PDF). Lloyd's Register. Lloyd's of London. 1934. Archived from the original (PDF) on 3 March 2016. Retrieved 27 May 2018. ^ Menendez, Carlos R (2 May 1934). "Katharine Hepburn in Yucatan awaiting action on divorce suit". The Atlanta Constitution. p. 19. ^ "Envoys plan leaving city on vacations". The Washington Post. 31 July 1932. p. S1. ^ Phillips, R. Hart (17 February 1939). "Cuban reception to Batista mixed" (fee). The New York Times. p. 11. Retrieved 22 January 2008. ^ "Mexico gold smuggling suspected under embargo". Los Angeles Times. 28 October 1933. p. 2. ^ "Mexican gold to London". The Wall Street Journal. 30 October 1933. p. 4. ^ "Gold arrival". The Wall Street Journal. 11 July 1934. p. 4. ^ "Gold and silver from Mexico". The Wall Street Journal. 29 January 1935. p. 8. ^ "Silver from Mexico". The Wall Street Journal. 12 March 1935. p. 8. ^ "Silver from Mexico". The Wall Street Journal. 17 July 1935. p. 15. ^ "Gold from Cuba". The Wall Street Journal. 22 March 1934. p. 7. ^ "U.S. refugee ships are for Americans" (fee). The New York Times. 28 September 1939. p. 7. Retrieved 22 January 2008. ^ a b "10 to 20 die in fire on ship off Brazil" (fee). The New York Times. 1 August 1947. p. 13. Retrieved 22 January 2008. ^ "Army gets Orizaba for a troop ship" (fee). The New York Times. 27 February 1941. p. 4. Retrieved 22 January 2008. ^ "Brazil transport, old Orizaba, here" (fee). The New York Times. 11 November 1945. p. 20. Retrieved 22 January 2008. ^ "Ship fire toll now is 27" (fee). The New York Times. 2 August 1946. p. 5. Retrieved 22 January 2008. ^ "Skipper of Brazilian Training Ship Is Greeted Here" (fee). The New York Times. 1 March 1954. p. 39. Retrieved 22 January 2008. ^ "Dinner parties on embassy row". The Washington Post and Times-Herald. 15 December 1955. p. 73. ^ McNair, Marie (26 October 1956). "Fechtelers plan 'anchorage' here". The Washington Post and Times-Herald. p. D2. Charles, Roland W. (April 1947). Troopships of World War II. Washington, D.C.: Army Transportation Association. OCLC 1871625. Crowell, Benedict; Robert Forrest Wilson (1921). The Road to France I: The Transportation of Troops and Military Supplies, 1917–1918 (pdf). How America Went To War. New Haven: Yale University Press. OCLC 287391. Retrieved 10 April 2008. Flayhart, William H. (2005). Disaster at Sea: Shipwrecks, Storms, and Collisions on the Atlantic. New York: W. W. Norton & Co. ISBN 978-0-393-32651-2. OCLC 56913373. Gleaves, Albert (1921). A History of the Transport Service: Adventures and Experiences of United States Transports and Cruisers in the World War. New York: George H. Doran Company. OCLC 976757. Mariani, Paul L. (1999). The Broken Tower: A Life of Hart Crane (1st ed.). New York: W. W. Norton & Co. ISBN 978-0-393-04726-4. OCLC 39890371. Naval Historical Center. "Orizaba". Dictionary of American Naval Fighting Ships. Navy Department, Naval History and Heritage Command. Retrieved 22 January 2008. Naval Historical Center. "Williamson". Dictionary of American Naval Fighting Ships. Navy Department, Naval History and Heritage Command. Retrieved 21 January 2008. Office of the Chief of Naval Operations (22 April 1944). "Ships' names (U.S. Navy)". U.S. Navy radio call sign book. Washington, D.C.: Navy Department. Office of the Chief of Naval Operations. OCLC 85776444. Retrieved 22 April 2008. Wikimedia Commons has media related to USS Orizaba (ID-1536).